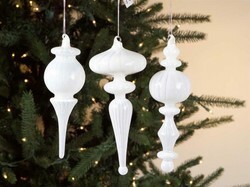 Traditional and elegant finial ornaments for your Christmas tree and other Holiday decorations. You'll love the large selection and low prices. Xmas finial ornaments are the ones that have the long tapered point at one end. I've seen a finial Christmas ornament as short as 6 inches and as long as 16 inches. They are made of many materials including handmade glass, porcelain, plastic and wood. For Christmas 2012 there's a lot of interest in glitter finial ornaments, as well as in the metallics of gold and silver. Animal print ornaments were really hot last Christmas, and I'm still seeing many leopard and zebra finial ornaments this year. Traditionalists will love the selection of indented finial ornaments. These are the kind that have a well in the side and are usually patterned. These are often vintage finial Christmas ornaments that were popular in the 1950s. All of the finial ornaments you see here are selling on ebay today - one of the most popular and trusted commercial websites in the world. Glitter finial ornaments are the rage for Christmas 2012. They'll make a Christmas tree of any color definitely sparkle. The finial ornaments shown to the right incorporate two of my favorite finial ornament features. First notice the indentation. It's brightly colored and textured.Then look at the swirls and pattern of glitter. Both of these features will reflect your Christmas lights perfectly. When I was little this kind of ornament reminded me of ribbon candy. Now, while I still have those memories they also remind me of a painted and hand-carved carousel. You can find hundreds of finial ornaments with glitter on ebay. You might choose the kind that I love that are a riot of rich colors. You can also choose silver- or gold-tone finial ornaments with glitter as well. For a very rich looking tree go with tone-on-tone metallic and glitter. I have to admit that this year I'm in the mood for lots of color. So I'm also looking for metallic and glass finial ornaments in bright pink, red and green. I think that these would also look fantastic on my fireplace mantle garlands and the front door wreath. When you use the same ornaments throughout your home on all of your greenery, it really ties them together visually. It's really a great idea to use a variety of sizes and shapes of Christmas ornaments. It keeps people interested in your tree. This is a great thing if you collect ornaments and get only a few weeks a year to show off your collection. I didn't start out to have a Christmas ornament collection. First I spent hours with my grandparents and even luckily my great grandparents wrapping and unwrapping and cleaning their Xmas ornament collections. Some of those even dated back to Victorian times. So when they've either passed away or moved, I've been given a lot of those ornaments that I loved so much as a child. And then I just love Christmas and decorating for it. My husband has often said that I picked out the largest house in town so that I could fill it with stuff. I really can't argue that point - except it was so run down it was also the CHEAPEST house in town. Santa rules the roost in our house from the day after Thanksgiving to New Years Day. I actually love Santa figurines as much as I love Santa ornaments. Because a sea captain built our home in the 18th Century, I love to have nautical things. So Santa always gets to go fishing, drive a boat, surf or swim. I wish someone would design a Santa Walking the Plank figurine or ornament. Anyways the point I was going to make is that when so many of your ornaments are themed like mine are. It's nice to have just neutral Christmas ornaments. That's what finial ornaments are. Generally they are just beautiful abstract shapes. Glass finial ornaments are wonderful with glitter finials. Then reflect light as well and sparkle in a different way. Their long shapes look great with round ornaments and I love the way they hang from the Christmas tree branches. So here are some great examples of indented finial ornaments. These give you maximum surface area to reflect your Xmas lighting. I know that I love them, but my two little black cats - Chaos and Busy Body - love them! In fact I think Christmas is their favorite holiday. While I enjoy collecting ornaments, those two love breaking them. So I have the giant Christmas tree in our living room, where I put nice ornaments, but not that ones that I got from my grandparents or aunts and uncles. Family heirloom ornaments are off limits for those two. So I have small ornament trees and displays to show these off in a safer environment. That means that I put these tabletop trees on tables in front of windows that can be seen from the street - and that have doors on them. As of yet Busy Body and Chaos have not figured out how to turn a doorknob. I go all out with these little trees and ornaments. They have tree toppers and tree skirts and tinsel. So they really do make an impressive sight from the street. When people come over they do like to browse them and see how I chosen themes. At times like that the cats are put in our bedroom. Nautical decor lovers will enjoy adding a lighthouse or two to their home accessories. You don't have to deliver presents on the back of a motorcycle to love these motorcycle Christmas ornaments. Elvis, Marilyn Monroe, Lucille Ball, and Frank Sinatra decorative ornaments give your Christmas tree a classic mid-Century style. Take your Christmas Tree for a walk on the wild side with zebra print ornaments and leopard print ornaments. I love to combine all kinds of ornaments so don't be afraid to mix your I Love Lucy ornaments with your animal print ornaments. I mean I bet Lucy loved leopard fashion accessories. You can also pick lighthouse ornaments in addition to nautical Santa ornaments to complete a seafaring home Christmas decor. Every year when I bring out my ornaments I think of the people that I have celebrated Christmas with over the years. It might be why I love ornaments so much! Nice selection of ornaments and Christmas ideas. A fabulous selection of Frosty the Snowman ornaments from all of the major ornament designers, including vintage and antique ornaments. You're favorite fisherman will love a Santa Fishing ornament to celebrate the Christmas holidays. Fans of nautical decor will love adding this to their Holiday decorations.